Every day, the products we make impact countless lives. This is a reality that we don’t take lightly. We make each one of our products as if the patient on the table were a family member or close friend. Bill’s philosophy was to consider that the products we make might be used on someone in our family—one of our parents or one of our kids. A device that could be used to extract kidney and bladder stones was among the early ideas that our founder, the late Bill Cook, had swirling around in his head. “He was always thinking of different markets and different ways to use the devices we were making,” recalls Tom Osborne, Senior VP, Growth & Development. Left: Tom Osborne at his desk in 1982. 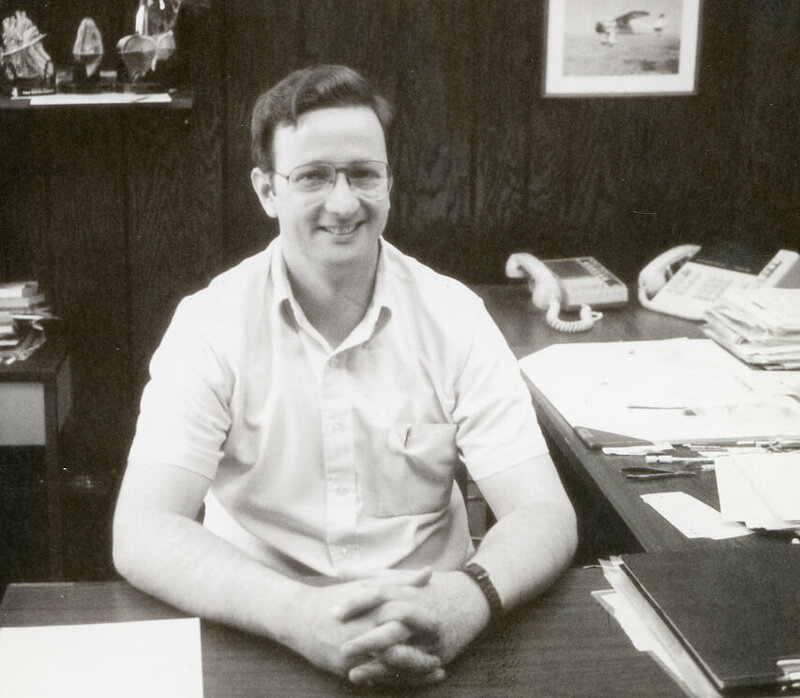 In 1964, when he was fresh out of high school, Osborne became Cook Medical’s first employee. By the late ’60s, Osborne was working on the design for a helical stone extractor similar to the baskets that were being used in France to extract biliary stones. With very few modifications, these baskets could be used in the urinary system. Pretty soon, one of Osborne’s modified baskets would be sought out for use by Bill Cook himself. In 1975, Bill’s wife Gayle was diagnosed with a kidney stone. The logical action for Bill was to give her doctor a Cook basket to extract the stone. As he often did, Bill approached the production department—specifically Maxine Lindsey, who was making the stone baskets—to inquire about a product. No one knew that the basket was for Gayle. “It wasn’t unusual for Bill to go down to production and ask for something. He wanted to see things. He would sort of inspect to see if the product was still being made properly and if it was safe, or he’d be showing the product to someone to get some new ideas. That wasn’t uncommon at all,” Osborne said. A few days after the procedure, Osborne found out that Gayle had had a stone and that it was successfully removed with a Cook basket. “Bill’s philosophy was to consider that the products we make might be used on someone in our family—one of our parents or one of our kids,” Osborne remembers. That philosophy remains at the core of our company today: putting the patient first. We put the same trust that Bill had in that basket into every one of the products we make today. We design our products well and test each one thoroughly. The end result is a quality product you can use, and your patients can trust. Right: Gayle Cook was a beneficiary of this extraction basket.